Thanks to all who wrote to the Scottish Executive to try to save Kingairloch Walled garden. The deadline has passed, and unfortunately the Scottish Executive has ruled that the swimming pool construction may proceed. This is a sad loss of a piece of Scottish History. About a year ago, many MacLeans (and others!) worldwide protested against the destruction of a historic walled garden in what were Maclean of Kingairloch lands on Morvern. This worldwide effort was successful, in that the councilors who reviewed the application voted against the destruction of the garden. The input of many of us from around the world was a major factor in preserving this historic site. The company has now appealed the local council's decision to the next level, the Scottish Executive. Please help protest this needless destruction of history. This is not as grand a site as a castle or monastery, but surely it is a sign of the ingenuity of residents of the Highlands. Any of us who have been there know of the cold winds that can delay or stunt the growth of many kinds of vegetation. This fine example of the clever walled garden idea (a precursor to what we call hot houses) is still producing fine crops, and it would be a terrible thing if it was to be destroyed, when there are so many other locations where the proposed swimming pool could be located. The applicant states that "a swimming pool will add to the existing tourist facilities and be of benefit to the area", but do tourists visit Scotland to see historic sites such as the Kingairloch Walled Garden, or to see a swimming pool similar to one they could see almost anywhere else in the world? Which would you rather see? Once destroyed, historic sites can never be recovered. It is vital that as many objections to the swimming pool being built inside the walled garden as possible are made to the Scottish Executive. Below are pictures of the garden, a scan of a newspaper article about past and present efforts to save the garden, and a brief history. For over three hundred years the lands of Kingairloch were held of the Crown by the Macleans and before them their MacDonald kinsmen. The main settlement, then and now, lies half a mile or so from the head of Loch a Choire on flat, fertile land intersected by the River Coinneach which falls from Loch Uisge to Loch Linnhe. The mansion house for the estate is situated on an elevated and sheltered spot on the north bank of the river surrounded by several cottages, a walled garden and until four years ago, a very old deer larder. Within a mile of the house, a site occupied for centuries, is a two thousand year old Bronze Age burial cairn, a 19th century meal mill, a graveyard containing headstones dating to 1760, an 18th century church where services are still held, an old school, blacksmith shop, an inn and many other interesting old farm buildings and cottages. When Donald Maclean of Kingairloch sold the estate in 1800 and sailed to America he left many of his family behind, some of whom are buried in the little graveyard not far from the house. The new owners, called Forbes, remodelled the mansion house and probably enlarged and enclosed the walled garden which, in those days, would have produced all of the fruit and vegetables required by them and their extended family throughout the year. The present handsome wall round the garden with its heavy slate coping stones probably dates to the early 1800s. Inside is some fine topiary of a similar date. The walled garden at Kingairloch is unique not only because it is one of the oldest in the West Highlands but, unlike others, it has not fallen into disuse and is still in use producing the most lovely fruit and vegetables. In 2006 Foster Yeoman, the owners of Kingairloch Estate, applied to the Highland Council for permission to knock down some of the surrounding wall and to build an ugly indoor, heated, swimming pool, tennis court and car park inside. At a meeting of the Council's Area Planning & Building Standards Committee on 18 December 2006 permission was refused on the grounds that the proposed construction of the swimming pool and the use of materials proposed would serve to destroy the character and integrity of the existing walled garden to its detriment as it would be contrary to POL 3.6.18 of the Lochaber Local Plan. Of the eight council members of the Planning Committee only one voted for the application and failed to get a seconder. 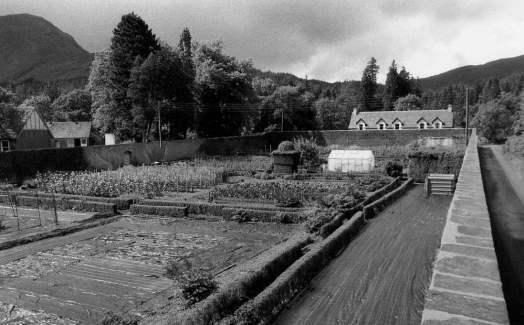 Those who voted for refusal commented on the importance of the site not only because of its local historic interest but because it was still in full production as a source of fruit and vegetables which, because of the high rainfall and often poor summers, is a rarity in the highlands. Note. The Lochaber Local Plan is a statutory document prepared by the Highland Council which guides decisions on planning applications in the Lochaber Area. POL 3.6.18 above states, "The Council will encourage restoration and suitable after uses for buildings not currently Listed but of local historic importance. These include: derelict Estate properties, redundant agricultural buildings, former industrial and commercial premises, disused churches and other public buildings". 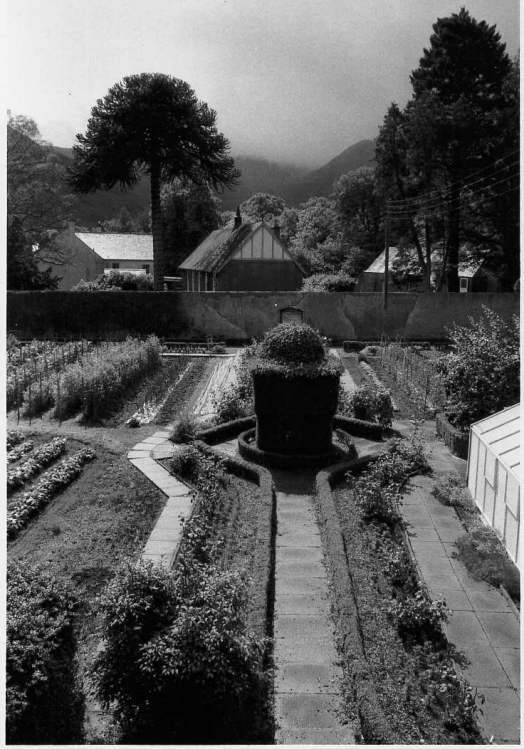 As the Kingairloch walled garden is neither listed with Historic Scotland nor derelict and in need of restoration the committee's decision was unambiguous and entirely appropriate. Despite the passage of time Kingairloch is of interest to the Clan Maclean world-wide, not only because the walled-garden was probably constructed by many of their forebears but it also forms part of Scotland's wider heritage which uniquely binds so many Highlanders together and brings Macleans especially from every continent to Duart and Mull in celebration. In the weeks before the planning meeting of 18 December 2006 many Macleans wrote to the planning officer lodging their objections to the proposal. None were against a swimming pool in principal but felt strongly that it could be built somewhere else on Kingairloch and that the historic walled-garden should be left undisturbed. This great interest for the homeland from overseas caught the attention of the local newspapers which, in turn, undoubtedly influenced the local councillors who turned it down. Now, less than a year later, Foster Yeoman has lodged an Appeal with the Scottish Executive in Edinburgh to have the council's decision overturned. They say a swimming pool will add to the existing tourist facilities and be of benefit to the area. However as visitors are not encourage unless they stay in the estate holiday cottages this is unlikely. 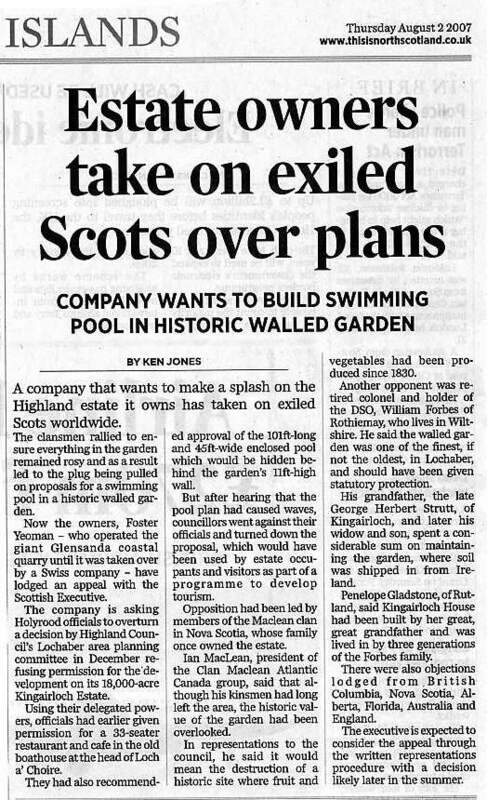 It is vital that as many objections to the swimming pool being built inside the walled garden as possible are made to the Scottish Executive.